The blog has been calling me all day, all week really. I’m starting a new challenge for the month of October. It’s called Write 31 days. Lots of bloggers gather together and make plans to write every day throughout the whole month. I thought about joining the community last year, but I wasn’t prepared or brave enough to give it a try. I didn’t want to fail by not keeping up with the posts and I didn’t have focus. Here I am this October and I’m ready for the challenge. I’m doing the “Five Minute” version and I’m glad each day comes with word prompts like my Five Minute Friday posts. Confession: I still didn’t find the time to prepare ahead. I had hoped, but life things can get in the way or approaching hurricanes can distract us. I also may not post every single day. That’s part of me not having a plan (yet)… but I will be writing. Somehow I will share the series with you, whether it is on certain days of the week or daily once I can give my brain time to catch up this weekend. Here is the current plan: 31 Days to (More) Freedom. 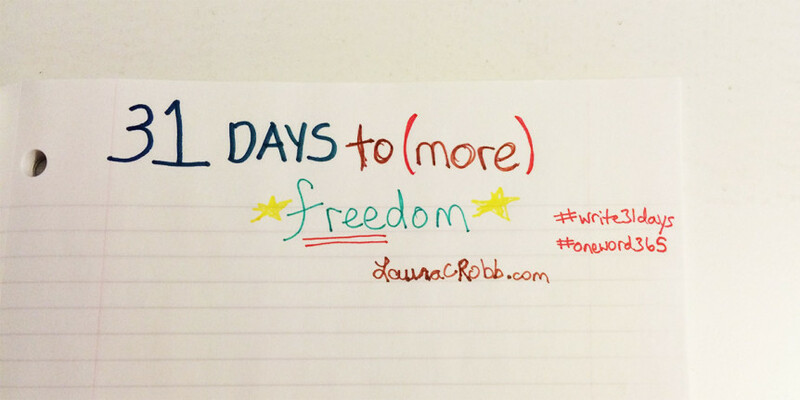 I’ve already noticed freedom is a theme for my year and I want to walk through that with you in a more concrete way. And since freedom is the topic, I’m giving myself permission to have a few days to ponder more deeply and possibly change my mind. Wherever we go this month, the writing itself is freeing. What comes to mind when you think of freedom?